ACDZip is a zipping and unzipping program that gives you the power to compress image audio video and document files. It includes fast image previews and is ideal for opening zip files backing up files saving hard disk space preparing files for distribution and protecting them with encryption and passwords.ACDZip has support for creating 8 archive types including ZIP CAB GZ and UUE. Share your archives by e-mail. Make self-extracting archives with text messages hyperlinked URLs and graphics. Plus protect your archives with passwords and 256-bit encryption. 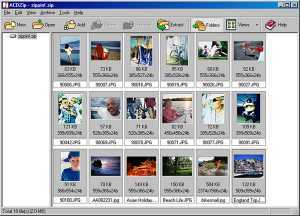 All of these features give you serious advantages over other zip software.With ACDZip you can view image thumbnail previews of image files within archives. These previewing features make it easy to ensure youre either archiving the right images or choosing to open or share the right archive. Enjoy previewing support for 9 image formats: BMP EMF GIF JPG PCX PNG TGA TIFF & WMF. Or increase previewing support to 40+ image formats when you have ACDSee. 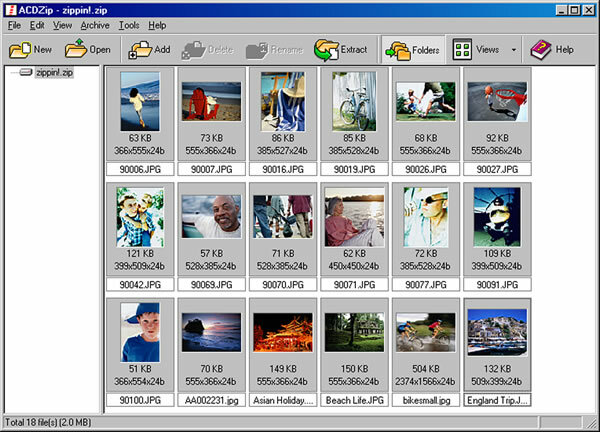 In addition to previewing images when creating and opening zip files ACDZip enables you to view modify and convert archives without the lengthy process of extracting and recreating them.The ACDZip file compression software enables you to save disk space back up files and prepare them for e-mail sharing by compressing and grouping them in a single location (archive). With fast image previews during and after archive creation you can ensure youre compressing the right digital images before you send them in an e-mail. Once you create your CAB files ZIP files or other archive formats (LZH TAR UUE MIME) you can share them by e-mail directly from ACDZip. ACDZip will automatically launch your e-mail application open a message and attach your archive to that message. All you have to do is add a recipient.ACDZip is the Zip software for digital images!